German soprano of Hungarian extraction, born September 1, 1941 in Oradea (Romania). At age six she began violin lessons and studied at the music conservatory in Cluj (Clausenburg). At fourteen she discovered her voice, began training as a singer (with Emilia Popp), and studied music education at the same time. She made her debut in Cluj in 1962 as a mezzo soprano and sang Gluck's Orfeo and Fiordiligi in Mozart's "Cosi fan tutte." In 1970 she auditioned for Christoph Dohnanyi and was engaged at the Frankfurt Opera in Germany. A year later she had a resounding success at the Munich Opera Festival as Vitellia in Mozart's "La Clemenza di Tito." She subsequently became a member of the Munich Opera ensemble and later the Deutsche Oper Berlin. Soon she made guest appearances at all the major German opera houses, at Covent Garden in London, and at the Teatro Colon in Buenos Aires. She also sang in New York at the Metropolitan Opera, at the Staatsoper in Vienna, and at the Salzburg Festival. Julia Varady first established a reputation in Mozart roles (Fiordiligi, Donna Elvira, Donna Anna, Countess Almaviva, Vitellia, Elektra, Cecilio) and recorded most of them under Karl Böhm. Soon she also became known for her performance of roles in the Italian repertoire, including Santuzza in Mascagni's "Cavallaria rusticana," Puccini's Madama Butterfly and Liu ("Turandot"), as well as Leonore in Verdi's "Il Trovatore" and "Il Forza del Destino", Elisabetta in "Don Carlo," Violetta in "La Traviata," Desdemona in "Otello," Abigaille in "Nabucco," and the title role in "Aida" (in Berlin with Luciano Pavarotti and her husband, Dietrich Fischer-Dieskau). In addition, she had successes as Tatiana in Tchaikowski's "Eugen Onegin," and in the German repertoire as the Composer in Strauss's "Ariadne auf Naxos" and in the title role in "Arabella," and as Senta in Wagner's "Der fliegende Holländer." 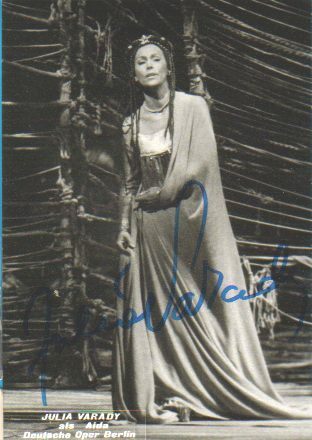 In 1978 she created the role of Cordelia at the premiere of Aribert Reimann's opera "Lear" at the Bayerische Staatsoper in Munich. She retired from the opera stage in 1996. 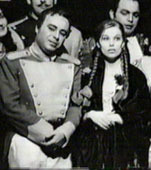 In 1977, Julia Varady married baritone Dietrich Fischer-Dieskau. They met in Munich in 1973 during rehearsals of Puccini's "Il Tabarro." The couple performed together as often as possible on the opera stage, as well as in concerts all over the world. They have made many recordings together, and since Fischer-Dieskau's retirement from singing in 1993, he has been the conductor on several recordings by Julia Varady of arias by Verdi, Wagner, and Richard Strauss. When not traveling, Julia Varady and her husband are generally at home in Berlin or at their villa in Berg on the Starnbergersee. Julia Varady has one son, Zoltan, from her first marriage and a granddaughter, Anna. They live in Budapest. In addition to her intense involvement with music, she is an avid reader and collects antiques. She is also an enthusiastic gardener and enjoys cooking. Julia Varady is still active as a concert singer. Recently she sang Richard Strauss's "Es gibt ein Reich" (Ariadne auf Naxos) at the Richard-Strauss-Tage in Garmisch-Partenkirchen to great critical acclaim (June 2001). She is presently a guest professor at the Hochschule für Musik Hanns Eisler in Berlin.